After the celebration of the Easter Triduum commences with the Mass of the Lord’s Supper, it continues with the Celebration of the Lord’s Passion on Good Friday. The service begins without the usual Sign of the Cross and Greeting of the Mass, and ends without the customary blessing and dismissal, reflecting that this is a continuation of the Triduum celebration. The Adoration of the Holy Cross is the central ritual of this celebration. It is unique to the Good Friday liturgy. It is fitting, therefore, that we give the time for everyone to participate in it. To open up the full richness of the ritual, and to allow everyone to engage in it, we offer the opportunity to everyone to come forward and venerate the cross. 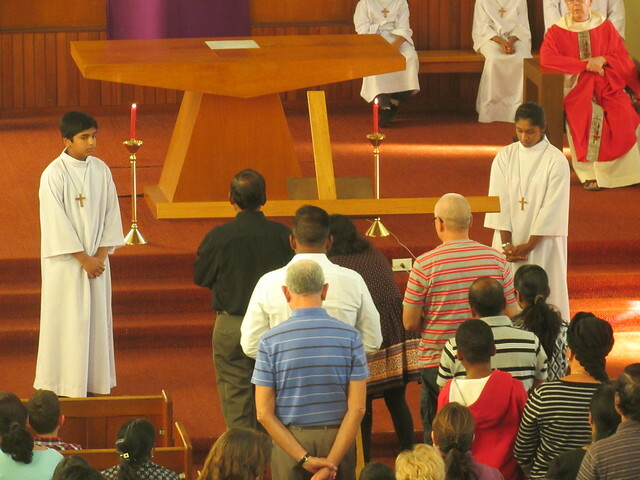 Having everyone come forward to venerate at the same time helps to unify both the assembly and the ritual. In accordance with long-held tradition, Mass is prohibited on Good Friday. The liturgy concludes with the distribution of Communion consecrated at Mass the night before.